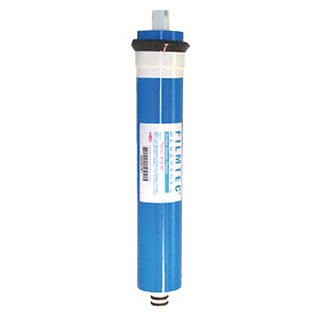 DOW Filmtec TW30-1812-100 Reverse Osmosis Membrane. Processes 100 gallons per day. Filmtec TMF-100 RO replacement water filter membrane that fits many standard RO systems. TFM / TFC stands for "thin film composite" membrane. Available as Regular, 90% rejection rate, and High Rejection, 98%. TFM-100 Reverse Osmosis membranes will fit many Reverse Osmosis systems that use standard TFM membranes between 24 and 150 gallons per minute. Filter model: DOW Filmtec TW30-1812-100 TFM100 membrane. Average NaCl Rejection rate: 90% rejection rate for regular, and 98% for High Rejection. Alt. Part Numbers: TW30-1812-100 , 170102. Alt. Part Numbers: TW30-1812-100HR . Also known as: Filmtec 170102 . This membrane will NOT fit some systems that use shorter membranes, such as Sears / Kenmore Ultrafilter and Whrilpool RO systems that use shorter TW30-1810-100 , 10" membranes.